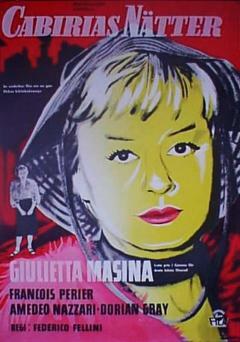 Cabiria, an innocent and unhappy prostitute, risks being killed by a friend who wants to rob her. She is picked up by a popular movie star, Alberto Lazzati, and brought to his estate. 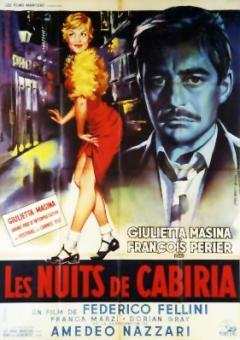 However, his mistress shows up and Cabiria gets locked in the bathroom all night with the dog. She then joins her fellow prostitutes to attend a service; she prays and hopes a miracle will take place. She meets Oscar, an accountant, who promises her a happy future. At first she is cautious and suspicious, but after several meetings she falls passionately in love with him and they get married only a few weeks later. During their honeymoon, Oscar becomes very nervous and violent and wants to kill her and steal her money. She throws her purse at his feet, sobbing, while he abandons her. Hours later, she picks herself up and stumbles out of the wood in tears. 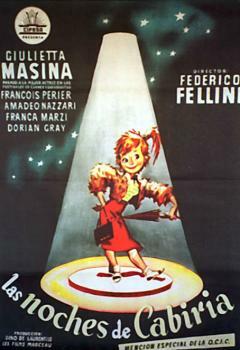 In the film's famous last shot Cabiria walks along the long road leading to town where she meets a group of young people riding scooters, playing music, and dancing. They happily form a parade around her until she begins to smile through her tears. "Censorship authorities had banned the movie but I didn't want negatives to be burnt. Thus, based on the advice of a clever friend of mine, an open-minded Jesuit, father Arpa, I went to Genoa to meet a famous Cardinal, who was likely to be elected Pope, to ask him to watch the film. A throne-like chair, with a large red pillow and golden fringes had been put in the middle of the room. The cardinal arrived at 12.30 a.m. on his black Mercedes. I was allowed to remain in the hall and I didn’t know whether the cardinal had really watched the whole movie or had slept throughout it. Probably father Arpa woke the Cardinal up exactly when processions or sacred images were shown. 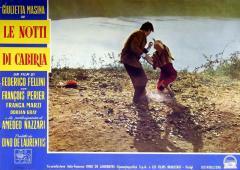 At the end he said: ' Poor Cabiria, we must do something for you!' I think he just had to make a phone call. Someone publicly accused me of being a sort of Richelieu, who didn’t fight openly, but rather conspired behind the scenes. Luckily enough at that time it was possible to waste time in this type of debates. Anyway, the film was saved, upon a condition: the shot of the man with the bag had to be removed, as the Cardinal had required. [...] The episode was inspired by an extraordinary character with whom I spent two or three nights in Rome: a kind philanthropist, a magician, who later had a vision dedicated to a particular mission: giving poor people all the food and clothing he had on his bag. This happened every day. I saw fairy things when I was with him. For example, when we opened a manhole and expected to find only mice and mud, we found a little old lady who was asleep. In the corridors of a sumptuous palace in Via del Corso – where the Socialist Party’s headquarters are now located - there were tramps who slept until five o'clock in the morning, as the night warden had let them in. The man's knew all these people, he gave one of them an injection, and another one some food. 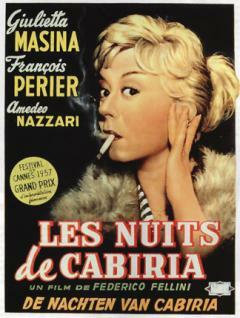 In the movie I imagined Cabiria when she met him on the Appia Antica road, while she was going home at dawn, and was angry as a customer had not paid her. She saw the man holding the bag leaving a car and heading for tufa quarries. He then stopped on the edge of a chasm and called a woman. A nasty old whore called ‘the Atomic Bomb’ came out of nowhere; she was living miserably then. 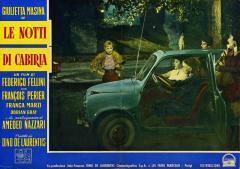 Then Cabiria agreed to go back home with the man by car and was very impressed by his stories. It was a very touching little shot, but I was forced to take it out, maybe because it upset some Catholic circles. 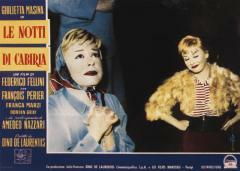 Isn’t it ridiculous that when Cabiria was screened, the Mayor of Rome protested because I had put the whores on a site - Passeggiata Archeologica (archeological promenade) - that he had tried to upgrade? 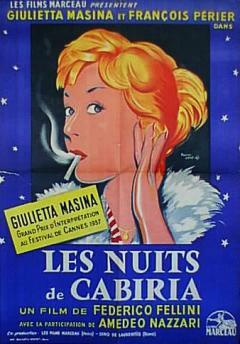 In Le notti di Cabiria (Nights of Cabiria) Fellini shows his balance, his powerful vision of characters and how he masters all film-making technical aspects. 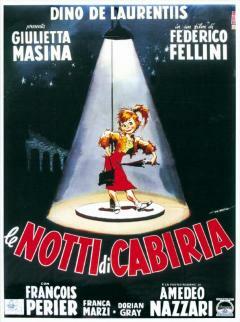 This is Fellini’s most mature film. You can rarely find some disputable moments in the film. 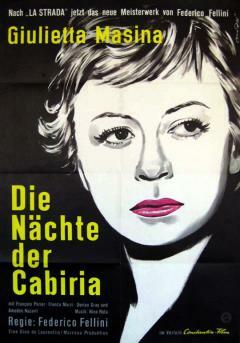 The poetic and moon-like character of Cabiria could not have been designed by another film-maker. 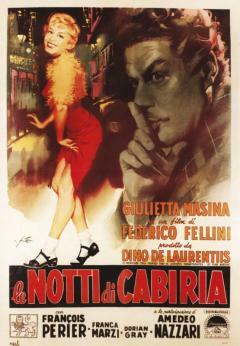 Only a director like Federico Fellini was capable of avoiding the danger of falling into an overly poetic or vulgar attitude – in that case the film might have been unbearable. It is not correct to say it is a fragmented film; you may get this impression at first, but it is wrong. Even though it is based on episodes, the story structure is rigorous and harmonious, like a symphony in which the various movements (episodes) are interconnected - detached but complementary in nature – and lead to the definition of the main character and her destiny. 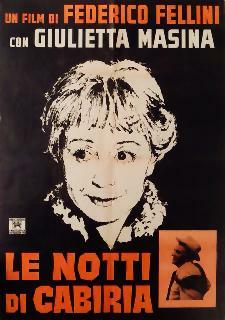 Charlot has often been compared to Gelsomina when discussing the film La strada, but I have never been fully convinced of having to compare these two characters. The first shot – that is not only worth of Chaplin’s work, but it equals its best ones - is the last of Le notti di Cabiria., where Giulietta Masina turns to the camera and her gaze encounters ours. I believe this film is unique in the history of cinema. Chaplin was able to systematically use this gesture, which undermines all film-making rules. It would not be correct for Cabiria to stare at us, as if she were a messenger of truth. Actually, the ultimate goal of this shot – that leads me to say he’s a genius - is Cabiria’s glaze passing through the camera lens repeatedly without stopping there. The lights are lit on this wonderful ambiguity. Certainly, Cabiria is still the protagonist of the adventures she had just in front of us, but she is now inviting our eyes to follow her on the road. This is delicate invitation on her part - and we may pretend she’s not addressing us - but it is also sufficiently direct to deprive us of our role as simple viewers.